We are already scheduling patients for this cutting-edge procedure! 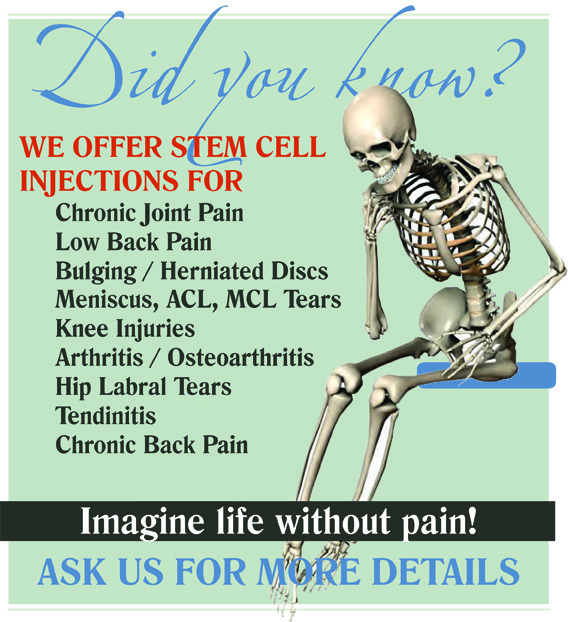 Call Today for Your Free Stem Cell Consultation! Financing for Stem Cells is Available! What is Stem Cell and Regenerative Medicine? Stem Cell and Regenerative Medicine is an exciting advancement in medicine! Mesenchymal Stem Cells (MSC's) occur naturally in every person, and are cells the body uses naturally to heal and repair. Injured tissues in the body give off signals, and MSC's "hone in" on those areas, and begin the process of repairing and regenerating the damaged and injured tissues. As we age, we have less and less MSC's in our body. Therefore, when we are younger, we can do certain activities and recover. However, when we are older, it takes much longer to recover (if at all!). To give you an idea, here are the approximate numbers of MSC's at various ages in life. As you can see, there are lots of MSC's in our younger years. MSC's repair muscle, bone, cartilage and tendons. Unfortunately, MSC's rapidly decline with age. This results in longer repair and recovery times, and individuals are more prone to aging and disease. It is because of this reason that our clinic uses umbilical cord stem cells in our treatment. We not only get a higher number of stem cells with each injection, but we also know the exact dosage of stem cells with in injection (compared with bone marrow stem cells, adipose [fat] stem cells, and amniotic stem cells). 1. We use stem cells that are taken from umbilical cords. Some families choose to bank their child’s umbilical blood in case they need it in the future. Other families choose to donate their child’s umbilical blood – our stem cells come from the donated umbilical cords of live, healthy, and full-term births. Donations are screened for communicable diseases just like a blood donation. 2. The stem cells are undifferentiated and immunonaive. This means the cells will not be seen as “foreign” by your body. Stem cells from one cord can go into several patients without the need for “typing”. Because the cells are immunonaive they will not induce a reaction from your body, so side effects are not an issue. This also means the cells are free to become the specific type of cell that your body most needs to repair itself. 3. Mesenchymal stem cells are predisposed to turn into bone cells (osteophytes), cartilage cells (chondrocytes) and muscle cells (myocytes). 4. Stem cells are smart cells – they know where to go! Stem cells are attracted to the inflammatory signals your body is exerting. When injected, the stem cells will seek out the source of the inflammatory signal and adhere to the site. For this reason you will be asked to avoid taking anti-inflammatory medications (Ibuprofen, Advil, Aleve, Naproxen, etc) for one week prior to your injection, and to avoid taking these medications for 2-3 weeks after your injection. We don’t want to quiet down the signal the cells are looking for! 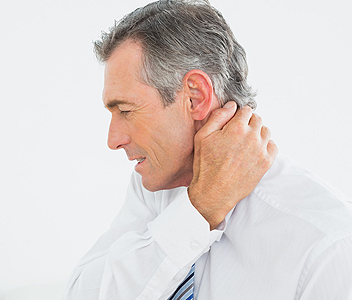 Acetaminophen based medications like Tylenol or Hydrocodone are fine to take. 5. Stem cells are live cells! And they are most plentiful in umbilical cords. On average 1 cc of stem cells from an umbilical cord will yield 10,000,000 (10 million) active stem cells, compared to ~250,000 active stem cells taken from a 30 year old patient. Not only that, but the cells will begin multiplying once they’ve been injected into your body. 6. Umbilical stem cells replicate every 28 hours. If you receive 1 cc, you will be injected with 10,000,000 (10 million) stem cells that will double in number every 28 hours. They will do this for up to 8 weeks. While the stem cells are replicating they are recruiting your own body’s stem cells to regenerate and heal as well. 7. It is not uncommon for patients to see noticeable improvement at their first follow up, 4-6 weeks after the injection. However, the entire regeneration process can take up to 6-8 months. It is at this point that patients are able to fully appreciate their improvement. 8. There are no drug interactions or side effects with stem cells. Other than avoiding anti-inflammatory medications before and after your injection you may continue your normal routine. The only exception to that is with exercise. You will be asked to avoid strenuous exercise and repetitive motions for up to a month following your injection (depending on site). At 4 weeks you may resume all normal activity. 9. The large majority of cases who are good candidates for stem cell therapy, only need one (1) injection for their condition. Only a small minority of patients need a 2nd injection 6-8 months later. Each patient's condition is unique, and you will discuss any future possible injections with your provider at your follow up appointments.